Igloo Product Corp., the number one cooler manufacturer worldwide, has updated its longtime favorite MaxCold® soft sides collection for 2014. 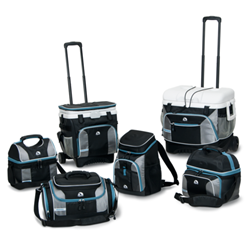 The 2014 MaxCold collection consists of eight classic Igloo soft sides—Hard Liner Cooler (HLC) 12, HLC 24, Hardtop Gripper 22, Gripper 16, Maxpack, Duffel, Cool Fusion 36 Roller and Cool Fusion 40 Roller—with 25 percent more insulation, upgraded materials and extra features. MaxCold soft sides have remained popular for so many years because they are built with durability and ice retention in mind. Igloo Product Corp., the number one cooler manufacturer worldwide, has updated its longtime favorite MaxCold® soft sides collection for 2014. MaxCold soft sides were first introduced more than ten years ago and have been a retail staple ever since. The collection is known for its superior materials, extra insulation and signature ice blue/black colorway. The 2014 MaxCold collection consists of eight classic Igloo soft sides—Hard Liner Cooler (HLC) 12, HLC 24, Hardtop Gripper 22, Gripper 16, Maxpack, Duffel, Cool Fusion 36 Roller and Cool Fusion 40 Roller—with 25 percent more insulation, upgraded materials and extra features. The updated features include crushproof EVA compartments for separate dry storage, pass-through back pockets for telescoping handles, and a new design aesthetic with hints of performance materials. The entire 2014 MaxCold collection, except the MaxCold Duffel, will be available at retail in the third quarter of 2014 with MSRP’s ranging from $21.99 to $39.99. The MaxCold Duffel will be available at retail in early 2015. For further information about Igloo MaxCold collection or about any other Igloo product, contact Katie Davis at kdavis(at)igloocorp(dot)com.